Cans of Campbell's tomato soup. New York (CNN Business)Campbell Soup has disavowed claims made by a company lobbyist that George Soros' foundation is assisting a caravan of migrants bound for the United States. In a tweet sent on Monday, Kelly Johnston, Campbell's vice president of government affairs, wrote that the Open Society Foundations has arranged for "troop carriers" and "rail cars" to support the caravan, which formed in Central America. Johnston's Twitter account has been deleted, and the tweet is no longer online. New York Times reporter Kenneth Vogel posted a screen grab of Johnston's tweet on Tuesday. 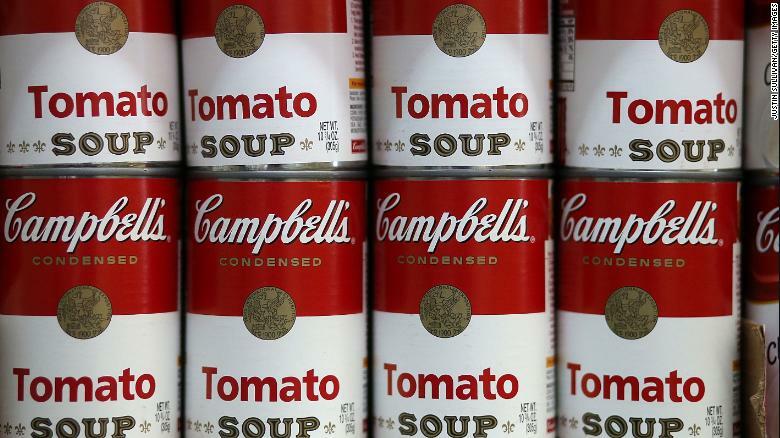 "The opinions Mr. Johnston expresses on Twitter are his individual views and do not represent the position of Campbell Soup Company," a company spokesperson said in a statement on Tuesday. Johnston did not immediately respond to a request for comment from CNN Business. Vice President of Government Affairs for @CampbellSoupCo @johnston_kelly (a former Secretary of the US Senate under Bob Dole) spreading conspiracy theory about @GeorgeSoros' @OpenSociety planning & executing migrant caravan "including where they defecate." The Open Society Foundations, which seeks to promote democracy around the globe, dismissed the tweet as false. "Neither Mr. Soros nor Open Society is funding this effort," Open Society tweeted on Tuesday. "We are surprised to see a Campbell Soup executive spreading false stories." "We do support the historic U.S. commitment to welcoming people fleeing oppression and violence in their homelands," Open Society added. A caravan of more than 7,000 migrants formed in Honduras more than a week ago. The migrants, who say they are fleeing poverty and violence, are making their way through Mexico to the US border. Some other public figures and politicians have suggested, without evidence, that Soros is funding the caravan. "The person who apparently has been financing this thing is George Soros," televangelist Pat Robertson said during an episode of The 700 Club, the Christian Broadcasting Network's flagship show, that was posted to YouTube on Monday. "Now we don't have hard evidence on that, but that's the suspicion." Congressman Matt Gaetz posted a video to Twitter showing someone handing out cash to a crowd. "BREAKING: Footage in Honduras giving cash 2 women & children 2 join the caravan & storm the US border @ election time," he commented. "Soros? US-backed NGOs? Time to investigate the source!" President Donald Trump has seized on the caravan as a political issue. On Monday, the president claimed he would declare a "national emergency" over the caravan. Trump also tweeted several questionable claims concerning immigration and the caravan, saying that "unknown Middle Easterners" are "mixed" in with the caravan, that he would be cutting off foreign aid over the caravan, and that Mexican authorities failed to stop migrants from coming into Mexico. The president has also accused Democrats of pushing for overrun borders.